Over at the roller rink, couple-skaters float to the pattering “November Rain” and sway to “The Dance”, by Garth Brooks. Up front, youngsters eat rectangular pizzas and drink Crystal Pepsi. There’s a middle-school girl with hair-sprayed bangs and red Wrangler jeans on, tucked in the corner making out with a boy named Ben Kweller. Tomorrow Ben will be walking down the Sabine River with his pal Wade, fishing for bass and smoking Camel Wides near the dilapidated moonshine still. In town, country music is inescapable and follows Ben wherever he goes, but when he comes home, he hears The Hollies’ harmonies from his dad’s turntable. And in six months, Ben will be skating that same rink as the chords of a new sound are played through the PA, a song called “Smells Like Teen Spirit”. The schizophrenia of music that hit his ears at that early age created the rainbow that critics have written about since his New York arrival in ‘99. He’s been called everything from balladeer to punk rocker, anti-folker to indie-popper. His ability to weave together opposites that coexist happily on the same album is something few can do. Unlike his previous albums, Kweller produced Changing Horses himself. “I’ve been lucky. I’ve worked with some of the greatest producers and learned from them all. For Horses it was time to take the wheel.” Clearly, a lot of time was spent on the arrangements, which come alive thanks to his stellar rhythm section, Chris Morrissey (bass) and Mark Stepro (drums). The jaw-dropping talents of Kitt Kitterman, (Pedal Steel and Dobro) are debuted here and play off Ben like a vocal duet. The 11-day recording session took place in Austin, TX at Public Hi-Fi, an all-analogue studio founded by Spoon drummer Jim Eno. Public Hi-Fi’s gear list wasn’t the only reason he recorded in Austin. “I’ve gone through a lot of changes in the past few years. Re-prioritized, found the important things in life. After our son Dorian was born, [my wife] Lizzy and I started to crave open spaces. Wanted to simplify. we needed nature. I was growing tired of writing songs in my apartment. I used to write outside all the time. I missed that. As a new father I started thinking about my parents and my roots, which were in Texas. In April of 2008, after nearly nine years in New York, the Kwellers packed up and headed south to their new home in Austin. “I’ll always love New York and the albums I made there. They have an urgency to ‘em that I really like, but of all the albums I’ve made, this was the easiest. It was so nice to sit around and make music with those guys. We’re brothers.” Those brothers include Ben’s long-time engineer Steve Mazur who turned the knobs at the old Neve desk. 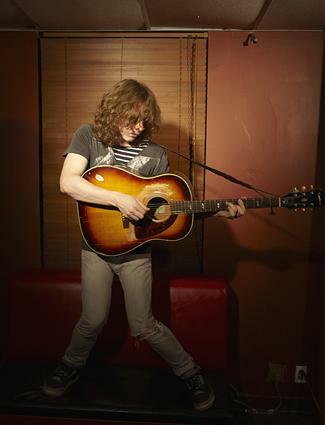 “I’ve always been at ease in recording studios,” Kweller says. “They’re magic places I can escape to, where everyday confines don’t exist. That’s why art is so important, there are no rules.” With his art, Kweller views the world with fresh eyes and empathizes with all walks of life. “This album’s about the people in the background, in the alleyways of society. I relate with them because we take life as it comes. We roll with the punches, twists and turns.” In the third verse of “Fight”, he sums it up, “Some days are aces and some days are faces, some days are twos and threes.” Changing Horses is a whole deck.